If your port does not have an ID number, please indicate if the port you want connected it on the right or left side of the room. Data (network) jacks will be a blue or sometimes orange colored port labeled with a "D" such as the one shown here. When completing the form you should indicate the entire port ID number. 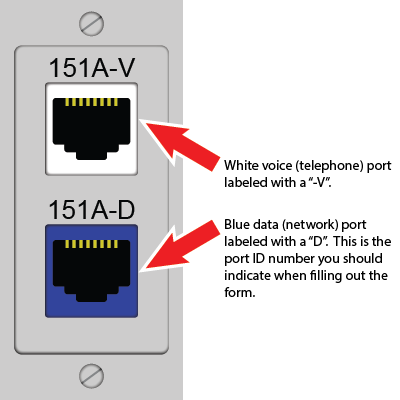 For example using the ports to the right you would indicate your port ID number as 151A-D. The cost to maintain both a wired and wireless network infrastructure is high with less than 10% of students opting for wired connections. As a result, most of the infrastructure that supported the wired network has been decommissioned in an effort to keep housing rates as low as practical. All students residing in residence halls and apartments are provided with access to the University's high speed wireless network at no additional charge. Rooms and select common areas have ethernet jacks installed, but these are now inactive. A limited number of wired connections are still available, but at an additional charge and only under certain circumstances. Technology Support Services has increased the speed, range and reliability of our state-of-the-art 802.11a/g/n/ac wireless network which is now is capable of delivering download speeds up to 100 Mbps (megabits per second). As such, a wired connection is not essential to maintain a quality network connection. TSS suggests students download a free WiFi analyzer app on their smartphone to analyze the signal strength in their living space prior to submitting this form. Signal strength is represented in decibels relative to one milliwatt (dBm) and is show as a negative number. Since the numbers are negative the closer the number is to zero the stronger the signal will be, therefore a reading of -70 dBm is a better signal than a reading of -100 dBm. TSS will not support a wired network connection request if they find a signal strength reading is greater than -70 dBm. You can use the chart below to compare your results. If the signal strength in your living area is within the Excellent and Good dBm ranges above, there may be an issue with your device. Please try to remedy any issues with your device prior to contacting Residential Computing. If you are unable to successfully resolve your issue, enter a service request with ResComp. All computers, gaming (PlayStation, Xbox, etc) and media devices (phones, tablets, streaming devices, etc) must be enrolled before they can be used on the wireless network. For more information on the University's wireless network, visit the Office of Technology's WiFi Network page. Please note, Kile apartments do not have WiFi as their high-speed internet is provided by a local service provider. Computers that do not have wireless cards built in (i.e. desktop computers) are typically easy to convert with the purchase of a wireless network card or USB adapter that is often less expensive than the cost to activate deactivated network jacks. A non-refundable fee of $50.00 to establish a wired network connection will be applied to your student account. If you voluntarily move (at your request or as a result of being detripled) and request a wired network connection in your new residence another non-refundable fee of $50.00 to establish the new wired network connection will be applied to your student account. The non-refundable fee will cover your wired network connection from the time of your request (no sooner than the beginning of the Fall semester) until no later than the end of the Spring semester so long as you do not move. The non-refundable fee will cover your wired network connection from the time of your request (no sooner than the beginning of the Spring semester) until no later than the end of the Spring semester so long as you do not move. The non-refundable fee will cover your wired network connection from the time of your request (no sooner than the beginning of the Summer session) until no later than the end of the Summer session so long as you do not move. Once submitted, your request will be completed as quickly as possible but it may take a few business days for the connection to be established. You should check your connection periodically to see if your port has been activated. If you do not have an active network connection after 5 business days please contact us at buhouse@bloomu.edu. To aid in the connection process please have your device turned on and plugged into the port indicated above. During the wired network connection process a Telecommunications staff member may need to visit your room while you are there to verify activation. Please select as Option 1 and Option 2 a day of the week and a time window you will most likely be in the room for a staff member to stop by. I agree to the terms and conditions above and acknowledge a $50.00 non-refundable fee will be charged to establish a wired network connection in my residence.